Barack Obama had Jay-Z, and President Trump has Kanye. Unlike the relationship between Obama and the Zs, Trump doesn’t need Kanye. Kanye could use a friend like Trump. This meeting shows that Kanye has access. And though Kanye can demonstrate strange behavior, believe it or not I think the guy is a genius. Kanye is frustrated. He’s that black kid who feels like he’s not being heard. Sure, he’s successful in his own right, but he’s lacked that mentor who can focus his energy. Recently we launched a project to get young black teens off the street and working, and Kanye would be the perfect profile of the teen I want to help. The innovation that exists inside of him is huge. The potential for more is even YUUGER! When we last discussed Kanye, he had praised Trump during his “Saint Pablo” tour concert. After the audience booed, Kanye abruptly left the stage. He would later claim that he was sick. However, rumors surfaced that he was not ill, but needed an “out” clause to not have to pay the promoter of his show. Then there was the Kanye sighting in New York, after which people said the tour was back on. “Honestly, he wants to prove to the world that he’s healthy and that he’s back. Kanye is not going away anytime soon,” the site’s tipster further contended. The cameo between Kanye and President-elect Trump may be what Kanye needs to get things back in check. But that’s not the bigger issue. 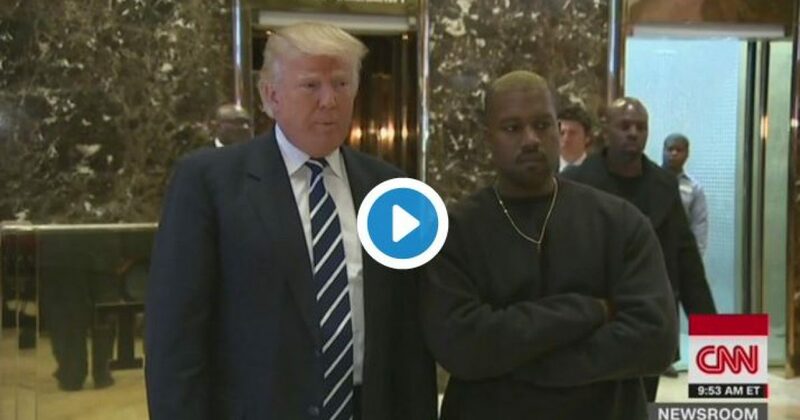 What will this the Trump Kanye West meeting mean in the black community? Remember when Kanye blurted out that Bush doesn’t like black people? You won’t hear him say this about President-elect Trump. And as for that racist Trump? Imagine what blacks will think of him in 2018, and again in 2020.